SINCE MY daughter Demi bought them for me a year ago, these trusty Merrells have now taken me everywhere, from Michigan to Manila to Melbourne. They started out feeling tight and stiff but have softened nicely without being too cushy. They’ve also taken me on hundreds of kilometers of walks that have lost me a few dozen pounds (no kidding). Here they are in a brook in Palawan (I got them wet in the ocean not too long after). 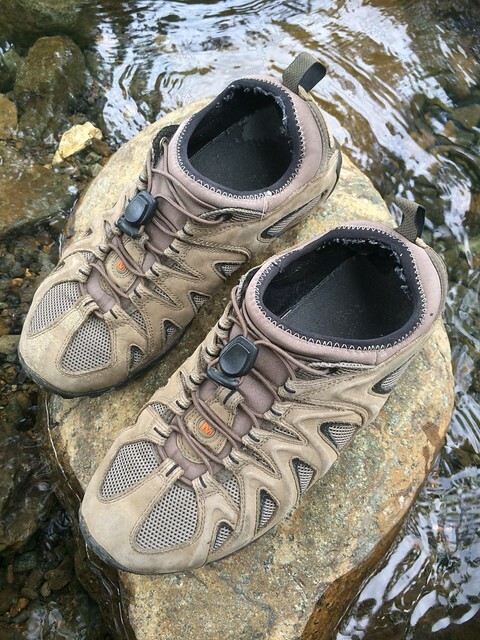 This entry was posted in Fun, Travel and tagged Merrells, shoes by penmanila. Bookmark the permalink. Of course I do and I will, anak, wherever I may be!